Marin Strasser has a secret. Her fiancé thinks her secret is that she’s having an affair, and he hires P.I. Roxane Weary to prove it. Then, just days into the case, Marin is shot to death on a side street in an apparent mugging. But soon enough the police begin to focus on Roxane's client for Marin’s death, so she starts to dig deeper into Marin’s life—discovering that the elegant woman she’s been following has a past and a half, including two previous marriages, an adult son fresh out of prison, and a criminal record of her own. The trail leads to a crew of con artists, an ugly real estate scam that defrauds unsuspecting elderly homeowners out of their property, and the suspicious accident of a wealthy older woman who lives just down the street from where Marin was killed. With Roxane’s client facing a murder indictment, the scammers hit close to home to force Roxane to drop the case, and it becomes clear that the stakes are as high as the secrets run deep. 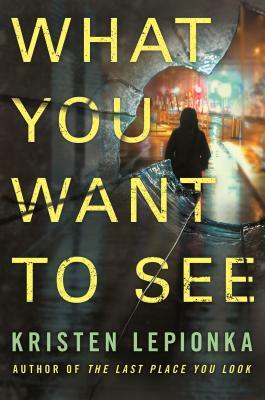 KRISTEN LEPIONKA is the Shamus Award-winning and Anthony and Mcavity Award-nominated author of The Last Place You Look and What You Want to See. She grew up mostly in her local public library, where she could be found with a big stack of adult mysteries before she was out of middle school. She is a co-founder of the feminist podcast Unlikeable Female Characters, and she lives in Columbus, Ohio, with her partner and two cats.